KHAIRPUR: Pakistan Peoples Party (PPP) leader Asif Ali Zardari said on Thursday the federal government had given the National Reconciliation Ordinance (NRO) to protesters who used derogatory language against state institutions. 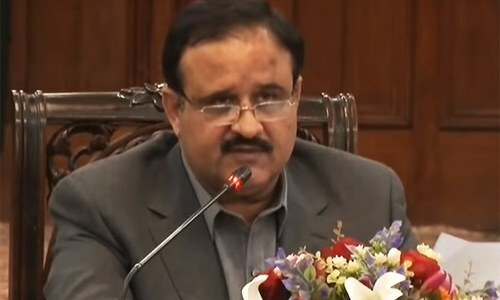 He was talking to reporters at the residence of former provincial minister Manzoor Hussain Wassan in Kot Diji. Responding to a question, Mr Zardari said that a few days ago the government had let go of people speaking against the country, but a number of innocent persons had been taken into custody. “Those 1,200 poor people who were captured on TV will be arrested but an NRO was given to those who had levelled the allegations,” the former president said. Mr Zardari said he had collected information on the problems of the area and would ask the Sindh chief minister to resolve the issues. The PPP leader said he told the federal government in the assembly to let the opposition do its business. He said that the feasibility of the Bhasha dam was prepared by the PPP government and they had made payment of land to the owners as well. However, he said that the real issue was that of saving water so that growers might be provided irrigation water as per the need of thousands of gallons per acres of agricultural land. He regretted that due to a hike in the rate of gas and oil by the government, the prices of daily consumption items had increased to a double, causing great discomfort for the people. In reply to a question, he said that no bureaucrat was ready to work in the current situation. He said that instead of relying on foreign loans, the capital markets of the country must be made stronger so that no need of foreign assistance arose in the future. The PPP leader said that the Sindh government had always given relief to the people of the province, and the government was giving relief to people of Thar and it would be better if the federal government released its instalments. The federation had cut the share of Sindh in the budget, he said.